What the Birkenstock Arizona Essentials Sandals lack in footbed customization, they more than make up for in practicality. Because of the shock-absorbing properties of EVA (Ethylene-vinyl acetate), the shoe is extremely lightweight and flexible. Not only is it waterproof, it’s washable, unlike the softer material of classic Birkenstock sandals. Birkenstock’s footbeds are all lined with suede, which is obviously more comfortable than plastic, but doesn’t fare well when wet. The EVA Arizona sandals have lasted me through many beach trips and pool sessions. I even brought them with me camping and rafting to wade through creeks when I didn’t want to wear my gross water shoes, and just hosed them off afterwards. One caveat though: if you have a high arch like I do, you may get some unwanted suction, which leads to some awkward fart noises on occasion. It’s a small price to pay, in my opinion. Everyone farts, get over it. The biggest selling point is the price. Because of the contoured cork footbed, normal Birks will run you around $100. That footbed allows the shoes to literally conform to the shape of your foot, and only your foot and it should go without saying that the EVA ones do not have this feature. But, that doesn’t mean that the footbed is flat and uncomfortable. 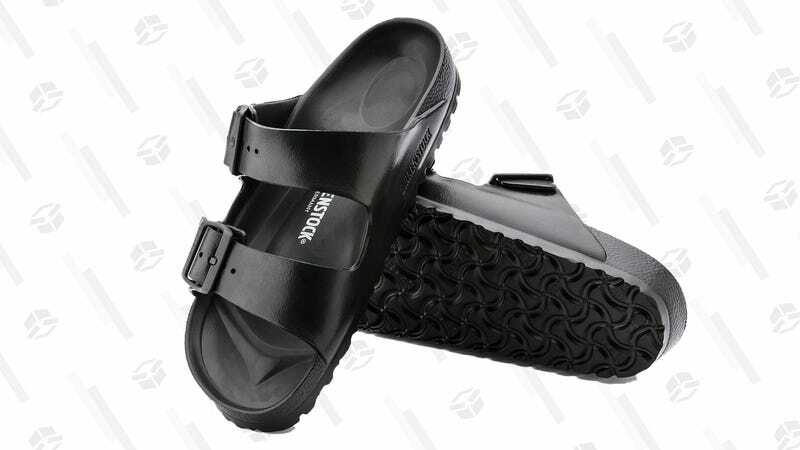 At $40 and in a bunch different colors, if you’re not willing to shell out triple digits on a shoe but love the look of a Birkenstock, this is the minimal sandal for you.